888 are a powerhouse when it comes to gambling, their award winning and innovative casino provided the Launchpad for the company to spread its wings into other areas of gambling. 888 sport is one of these branches, and although relatively new in comparison to some of its competitors, it’s already making waves within the industry. This is of course helped by the great way that 888 embrace innovation, and 888 sport are one of the sites leading the way in mobile betting. In this guide I start by describing how you’ll get started using the 888 sport mobile options. I then explore which devices you’ll be able to use, with a particular look at iPhone, Android and general tablet options. I then make a comparison between the mobile options and the website itself. To get started you’ll head to the 888 Sport website and register if you are not a member of the site already. Then click on the ‘mobile’ button at the top of the screen which will show you all of the mobile options you’ll have. On this page, you’ll see full instructions as to how to download both the iPhone and iPad Apps and the Android App. There is also instruction as to how you’ll find the mobile site. The iPhone App for 888 Sport has a nice look to it and manages to avoid the cluttered feeling of some other mobile betting apps. It manages this by having all of the available options available by scrolling down the page. Some will prefer having a large number of options in view immediately, while others will prefer the method this App employs. You’ll find the most popular sporting events of the day already loaded, with the biggest live televised sports of the moment at the top of the page. By scrolling down you’ll find all of the options you’d want on a betting App, including the Betslip at the very bottom. As well as using the App, you’ll also be able to visit the mobile site, which is exactly the same as the App. This might be your method of choice, as it won’t require you to download the software and you’ll be able to access it quicker. When entering the address for the Android App, the App will download, however you should be aware that you may have to tinker with the settings of your device, to allow Apps that don’t come directly from the Google Play store (I’m sure many of you have this setting enabled anyway). Of course, the mobile site is also an option here, and this might be preferable for many. The Android App is exactly the same as the iPhone App with the same ‘scrolling’ action and options available. When using the App on an iPad or an Android tablet, the App is exactly the same apart from an added menu bar on the left hand side of the screen. This menu bar gives you quicker access to the biggest sporting events. Once again, the mobile site is the same as the App version, and here is a screenshot of the mobile site in action on an Android tablet. 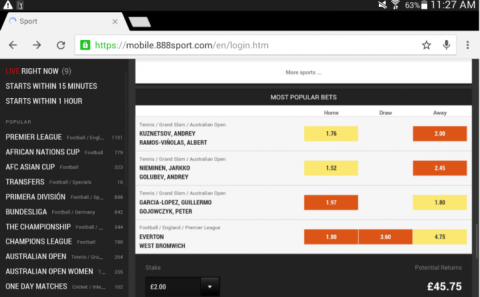 I’ve always found the 888 Sport website to be one of the best there is, the site not being over crowded with promotions, casino links and markets like some of the other leading sportsbooks are – the 888 sportsbook having just the right mix. So the question I had was, are the mobile apps of the same standard? In general I’d say yes, the Apps do match up, especially when using them on a tablet. On a phone, I’d like one or two more buttons at the top to navigate to parts of the App, but this is a small criticism of an otherwise straightforward and very usable App. When joining 888 Sport you’ll be given an £88 welcome package – place a £10 bet and receive a £10 token. Keep betting and you’ll receive the whole £88 (offer also available in Euros). You’ll also receive a £5 free bet for the casino and a £5 no lose mobile bet. You’ll also find a number of original promotions, the majority of these based around football - including a free bet refund if number eight scores in a football match and another free bet if your team fails to win due to an 88th minute or later winner. Check out www.888sport.com for yourself now!